A bespoke popcorn gown for the launch of the YSL biopic. To celebrate the launch of the ‘Yves Saint Laurent’ biopic at Vue Cinema London. To design and create a glamourous gown inspired by YSL fashioned entirely in items you would find in the cinema. 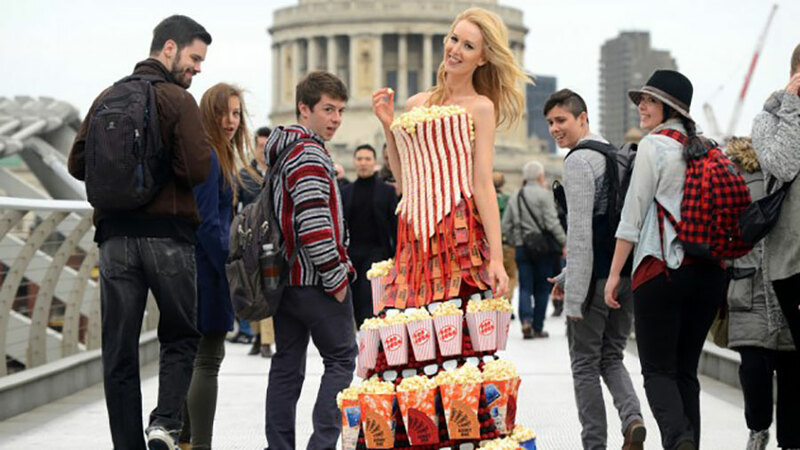 A red velvet undergarment gown and corset where created and then covered in over 1,722 of the cinema’s pick n’ mix sweets including flumps and liquorish cables, 2,202 individual pieces of popcorn, 100 cinema tickets, and 50 pairs of RealD 3D glasses. This fabulous dress took over 80 hours to create and was photographed on the millenium bridge and was featured in the press. This incredible gown was put on display for 1 week at Vue Westfield in Shepherd’s Bush. Eventually the client kept the dress at their head office. More about this case study here.